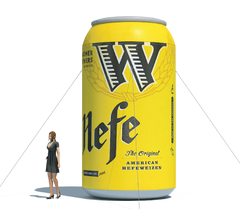 Our Bronze package is an ideal marketing set-up for any company or organization that is just getting into brand expansion. 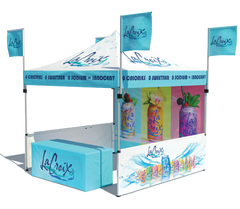 This great entry-level package comes with a fully printed tent top so you can advertise in style with unlimited colors and graphics throughout. 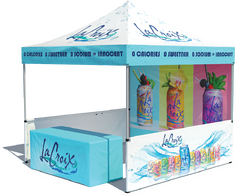 Fully Printed Tent Top: Our commercial grade vinyl tent top material is 100% waterproof and NFPA certified fire retardant. 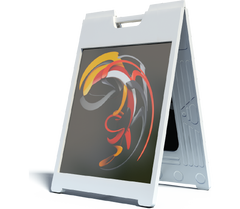 Our digital printing process allows us to print any color or logo in high resolution. Do you have specific colors you’d like to use? Well, thanks to the Pantone Matching System, we can accurately match any color you want. If you have your own logos or graphics that you’d like to use, send them over and our team of designers will come up with a great design in a matter of hours, not days. The heavy duty material used on our canopy tops is also coated with a special UV protectant to prevent the printed graphics from fading or scratching off. Free Stake and Rope Kit: This package includes metal stakes and tough nylon ropes for each leg. This helpful little kit will help ensure your tent stays put, in case of light wind. For increased security, we also offer heavy duty stakes, sand bags, and cement ballasts as well. Free Roller Bag: This package includes metal stakes and tough nylon ropes for each leg. This helpful little kit will help ensure your tent stays put, in case of light wind.